Cranleigh Specialist School has over 80 students aged between four and 12 years of age, most of these students have Complex Communication Needs (CNN). We are strongly committed to providing all children with a voice through a range of communication approaches. This professional commitment is a major focus of each student's Individual Learning Plan (ILP). 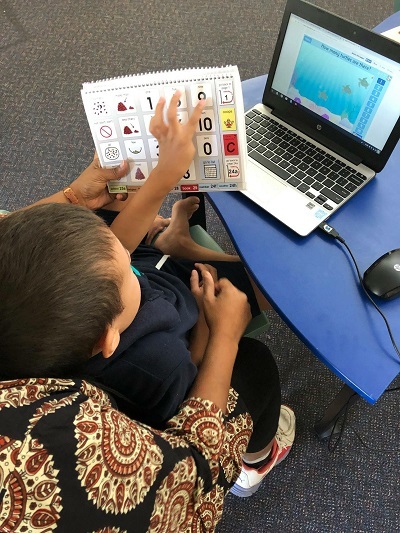 In partnership with the Network Student Enagagemnet Teams (NSET), private therapy providers and families, a student's communication capability is profiled utilising a range of assessment tools. Cranleigh prides itself as a Total Communication Environment and each staff member has a Pragmatic Organisational Dynamic Display (PODD) to use in all teaching and learning experiences. PODD is a way of organising whole word and symbol vocabulary in a communication book to provide immersion and modelling for learning. The aim of a PODD is to provide vocabulary: for continuous communication all the time, for a range of messages, across a range of topics and in multiple environments.